A first hunt to Africa may be your lifelong dream and yet... you may be unsure about the journey and whether it will be worth it in every sense. 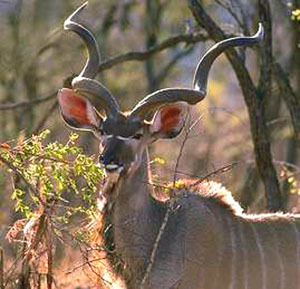 It is a fact though: most people, who have experienced an African hunt or sightseeing trip once, do it again and again. The diverse natural beauty and the abundance of wildlife on the continent, makes it such a paradise for the animals and thus for any visitor. For hunters and adventure travelers, South Africa and Namibia are very famous destinations in Africa. This is due to the fact that these countries have enjoyed and continue to enjoy relatively stable political environments. South Africa and Namibia encourage tourism. Thus they have become the ultimate destinations for individuals and families from the world over seeking an African experience. The planning and booking for a first adventure or hunt to Africa may at first seem daunting, a little intimidating, and even a little scary. However, resources abound to help you plan your adventure right down to the most minor detail. So, the Africa you thought was "too far away, too dangerous, too wild, too primitive" disappears, and your trip becomes one to remember for a lifetime. Regardless of your age, such an adventure will provide you and your loved ones with a shared experience that will give you fond memories for years to come. This may be the best investment in your relationship ever. Namibia in Africa (get here travel information) is a country of contrasts. Situated just north of South Africa, it covers 318, 259 sq mi with a population density of only 6 people per sq mi. Here you will find the Namib Desert and the breathtaking Atlantic coastline in the west, the great pan of Etosha and the vast rivers of the Caprivi Strip in the north, the mountainous central highlands, the flat plains and deep canyons of the south and the great Kalahari Desert in the east. The Kalahari can be described as the largest continuous stretch of sand in the world. This region became more widely known because of the famous television show "Meerkat Manor" on Animal Planet. Every animal species in the Kalahari does indeed entertain its visitors with its interesting features and fascinating ways it has adapted to survive in this unique region of Africa. Hunting in or visiting the Kalahari will enrich your life in many different ways. It may be the best place to start exploring Africa since it will bring you in contact with African-nature itself. The people and animals of the Kalahari have learned to be at peace with their environment and circumstances, which may vary from extreme droughts to times of abundance. 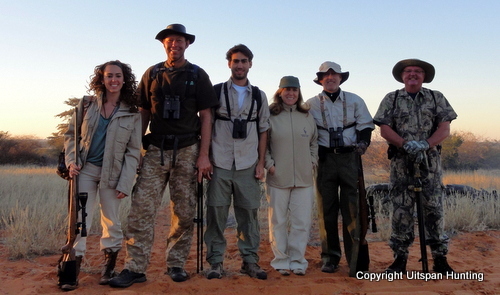 Kudu hunt video taken on Uitspan Ranch in the Kalahari of Namibia. These facts about life in the Kalahari have had a certain influence on the people living in this region. Longtime inhabitants of the Kalahari tend to be content with life, but also resourceful in developing better living conditions under the given circumstances. They will challenge frequent droughts by using the meager food resources offered by nature in clever ways with the best interest of animals and wildlife in mind. Great distances between neighbors and small towns force people to keep their focus on the basics of life: working in and with nature to support their families, the importance of family-life, and believing in the providence and predestination of God as the Ruler of the whole of creation. The ways of the people, the nature of the Kalahari and the wildlife here will let you feel, see, smell and get in touch with Africa herself. For any first-time hunter in Africa, a hunting experience in the Kalahari will introduce you to the unique characteristics of the continent. "Youth is not a time of life; it is a state of mind. a vigor of the emotions; it is a freshness of the deep springs of life. This often exists in a man of fifty, more than in a boy of twenty. Nobody grows old by merely living a number of years; people grow old by deserting their ideals." If you have this youth, an appetite for adventure and the desire to experience hunting in Africa, the Kalahari is an ideal place to touch ground in Africa for that first hunt. Roger D. Libby of Washington, USA, visited Africa once on a hunting safari. He wrote the winning story in our "African Hunting Story contest". Read the story he called "You Only Go Around Once..."
Read also John MacDonald's Why Africa?